Despite what some people may think, having children doesn’t necessarily prevent you from having a winter sports holiday. In fact, holidaying with the children can turn out to be an enjoyable and educational experience for all concerned. When is the Best Time to Take Children on a Winter Holiday? "If the children are of school age then the timing of the holiday needs to be taken into consideration as well as their educational welfare. Most schools limit the time that children can be taken out of school during term time due to Local Education Authority guidelines, but even travelling during the February half term need not be too expensive." "If travelling to North America then jet lag is a possibility on return, so a day or two should be set aside when returning to adjust back to UK time. It’s usually better, and often permitted, to take the children out of school for a day or two before the half term starts so that the Jet Lag is out of the way before returning to school after the half term." "The reputation of some North American destinations may lead you to believe that it would leave a big hole in your Salopettes where your wallet used to be, but prices can be comparable, and sometimes even cheaper, then the usual European destinations over the half term period." "Long haul flights to Boston, USA for the New England ski areas, or Calgary in Canada for the best that Alberta has to offer, such as Sunshine Village or Lake Louise, need not fill you with fear, having to entertain your children for hours on end. Portable games players and in-flight entertainment can combine to while away those long hours. Some of the scheduled airlines even provide dedicated flight bags for children containing puzzles, pens and alike." "Accommodation in North America is child friendly as well, offering free places for children when sharing with an adult. Most North American hotels offer two double beds as standard, meaning a family of four can all share one room bringing down the cost quite considerably. Other amenities are sometimes provided as standard as well in some North American Hotel chains, such as swimming pools, hot tubs and free continental breakfast." "The Ski areas themselves are geared up towards the complete family experience, with facilities including day care for very young children; a combination of indoor and outdoor play for the older toddlers and all day ski lessons for older children, including lunch. Some North American resorts even offer free equipment rental and lift passes to children when adults rent and ski. Another advantage of the North American resorts is their wide open runs with minimal traffic, even during holiday periods." 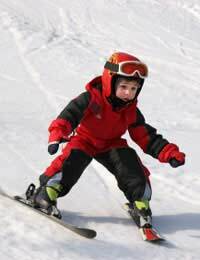 "When it comes to lessons, the Ski instructors are able to impart their knowledge of the sport to the children in a manner they will understand very easily, and with low pupil to instructor ratios, Skiing or even snowboarding skills are quickly assimilated by the youngsters. Don’t be surprised if after one day your little ones can’t wait to demonstrate their French Fries and Pizza Wedge techniques." "If your children progress well, why not combine lessons with family ski time? Three days lessons and Three days family skiing is a good combination for a one week holiday. You’ll be surprised how quickly they progress and capable they become, resulting in wonderful family moments on lifts and thrills taking on the mountains together. Not to mention the satisfaction and pride of completing a run with your offspring and then doing it all over again, but just a little bit faster." "If all of the above doesn’t convince you that a family skiing holiday can be both enjoyable and affordable then maybe the Après-Ski activities at the Vermont Resort of Killington will. Daily Après-ski activities, such as puppet shows and ‘Make your own ice cream Sundae’, are laid on free of charge for children after the lessons stop. This will keep the children entertained while you rest those aching legs and partake of the local speciality, hot-apply cider!"